We Got Served’s “Using OS X Lion Server at Home: A Step by Step Guide” by Terry Walsh is a good introduction to OS X Lion Server, I read this one after reading Using Mac OS X Lion Server: Managing Mac Services at Home and Office, Its more aimed at setting up OS X Lion Server for a home environment, than SOHO, however it was a interesting read with plenty of screenshots. 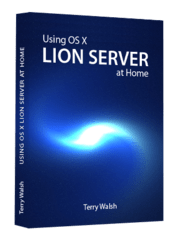 Using OS X Lion Server at Home is the “missing manual” for Apple’s OS X Lion Server operating system. If you’ve ever thought about powering your digital home with an Apple Mac home server, then this eBook (in PDF and ePub formats) takes you step by step through selecting the right hardware, installing and configuring Apple’s server operating system. Written in straightforward language for non-geeks and those new to OS X, this comprehensive guide ensures you can get the most out of OS X Lion Server in the home by walking you through the product’s essential features, including file and folder sharing, setting up shared family calendars and contacts, remote access, backup, media streaming, managing iPhones and iPads and more.